This is a summary of three wonderful days of hiking through the 75,120 acre Holly Shelter Game Land. Yes, it took me three days to hike my proposed route through this unusual wild country. 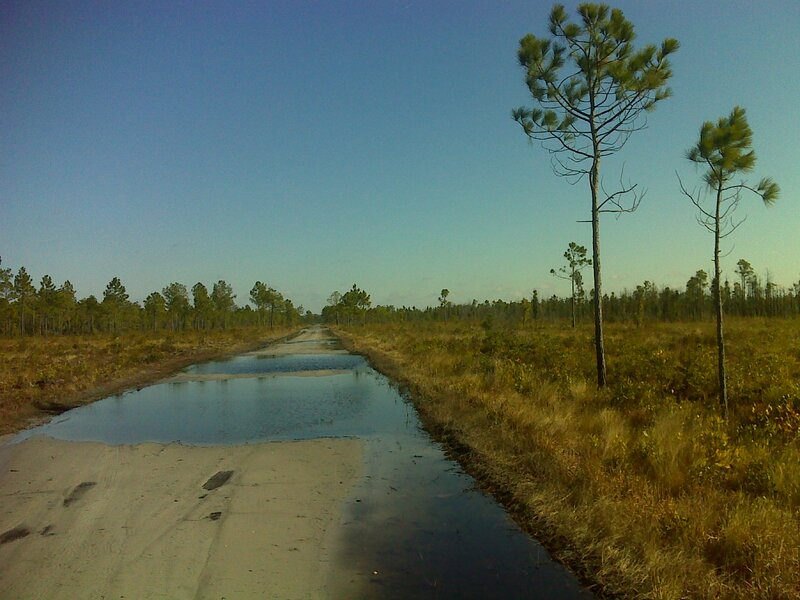 A lot of what I passed through reminded me of savanna ecosystems, but in fact it's what's called the "Carolina Bay and Pocosin swamp habitat" and it's obviously much wetter than a real savanna. It's home to some exotic plants such as the venus fly-trap. The wettest parts are cypress swamp complete with their unique 'knees' protruding up out of the water. And the dry parts are highly fire-prone even though the water table is just a few feet down. In fact this entire ecosystem is highly fire dependent. And that's a good thing, because Holly Shelter had a major fire that devastated 49 square miles of it in the summer of 2011. I remember that fire well. For weeks those of us who live nearby had to deal with the smell of smoke - a thick pall of it, visible from space, which turned the sky a reddish brown. Sometimes it felt hard to breathe. Sometimes it was so bad (both fumes and visibility) that they closed the adjacent highways. At my condo on the beach I had relief from it on many afternoons when the sea breeze kicked in. 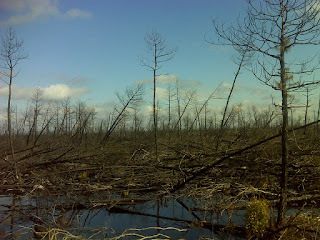 The fire started with a lightning stroke on June 19th, and quickly spread through the tinder dry forest. It got down into the layers of peat beneath the surface and there it smoldered. There was nothing that anybody could do to put it out at that point. So it just burned and burned until finally the heavy rains from Hurricane Irene put it out in late August. But back to my hikes. All three of them were on very lightly traveled gravel roads that are open to traffic only during the winter months. During summer the gates are closed. 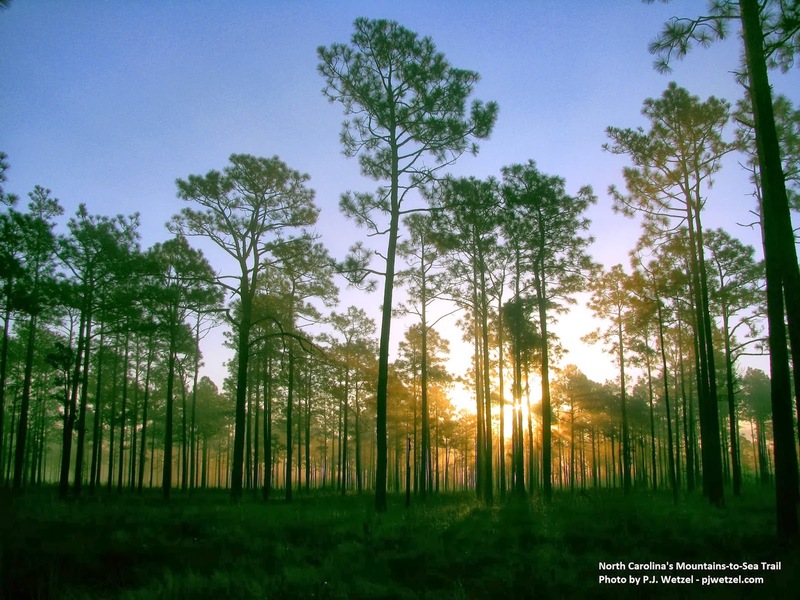 The first is the peculiar Longleaf Pine that starts out life looking like a clump of grass. Then after five or so years, in a sudden burst of growth, it vaults up through the high-risk fire zone full of dry grasses and resiny shrubs and establishes a thick bark 'hide' very quickly. This species has needles that are often more than a foot long, thus its name. Nearly all the trees in the photo at right are Longleafs. 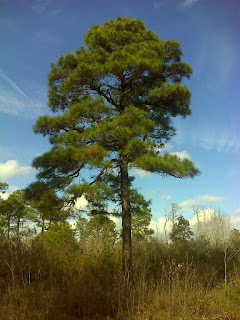 Second is the Pond Pine, a close cousin of the more common Loblolly Pine. It is not so fire resistant, but like the Lodgepole Pine of the Rocky Mountains, its cones open and release seed primarily in response to fire. 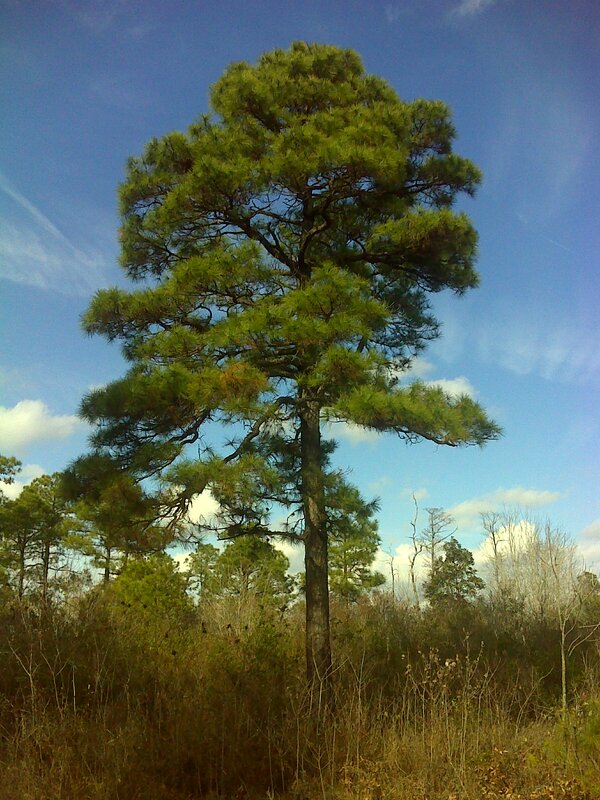 At left is a good example of a mature Pond Pine. It has a considerably denser crown than the Longleaf, shorter needles, and a much smaller cone. The Longleaf cone is huge. The only larger cones I've seen anywhere are on the majestic Sugar Pine, companion to the Giant Sequoias out west. This was a pleasant peaceful hike (I only met three vehicles on the road all day) with mild weather and the forest birds for companions. Thursday started out foggy, and sunrise through the woodland was magical. Then as the fog dissipated under the morning sun I crossed into the fire zone. In the heart of it there is not a tree left alive as far as the eye can see, horizon to horizon. 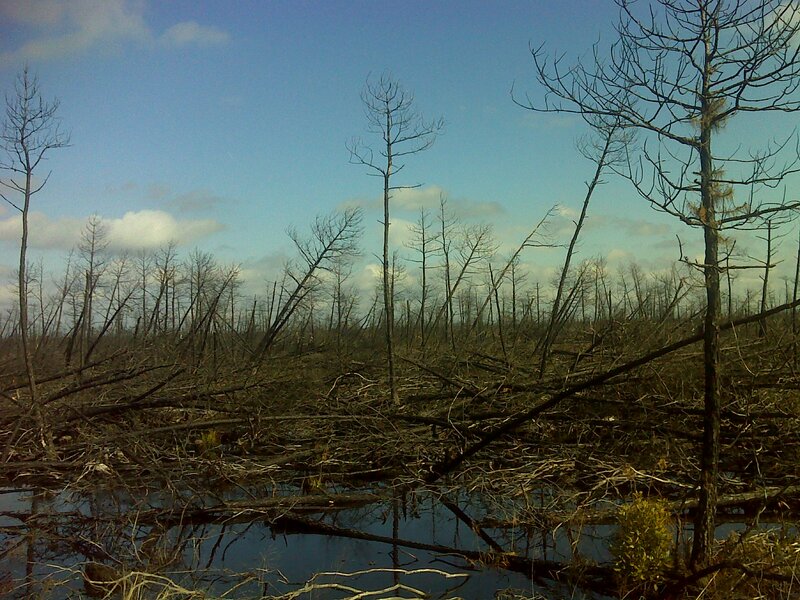 Even the fire resistant Longleaf Pines died because the fire got down into the peat and killed their roots. Yet two years later there are plenty of young seedlings springing up, and plenty of wildlife. 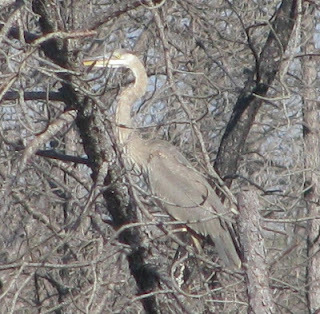 For what seemed like half the day I was chasing a great blue heron, who seemed to want to hunt the wetland channel beside the road, deepened when the road was built. Whenever I got close to him, he launched and flew ahead a few hundred yards then dropped down into the water beside the road until I got close again. This repeated at least a dozen times before he wised up and finally veered off to land behind me. And then on my way back ... there he was ... and we played the same game all over again. It was another fine weather day and I met just four vehicles as I hiked. On Friday I finally emerged from the north end of the fire zone and into the only part of the game land where the land wasn't perfectly level. There were some sand hills here, and in between them the road I walked was more like a lake in places. There were more than a dozen of these road-wide 'car washes', and I don't think they ever completely dry up - at least not during the winter. Because of the quality of these roads, only one vehicle passed me all day - an elderly man in a jeep with his dog. I saw a flock of wild turkeys, too. But they spooked and flew off before I was close enough to get a photo. I actually have a few more miles of hiking to do within Holly Shelter before I'm out the northwest side of it. But I've put in my quota of 100 miles for this month, so now it's time to get back to some writing. 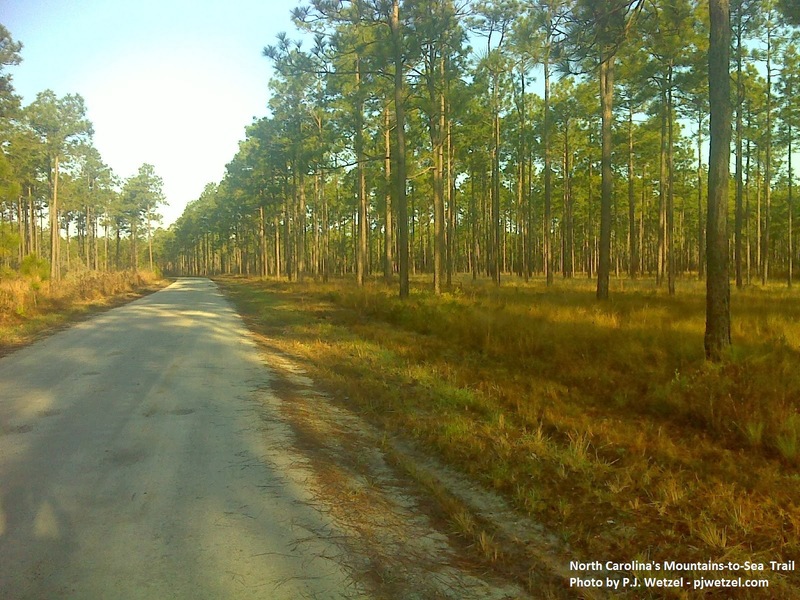 Hi, PJ - I came across your site while researching images of the Longleaf Pine and the fire forests of the Southeast. I am a speaker on leadership and change and I am giving a talk soon that will feature the Longleaf as a metaphor for resilience and adaptation. Would you be willing to grant me permission to use two of your photos in me presentation? The one with the road on the left and the one at sunrise? Both are exceptional - the best I've come across. I will provide appropriate credit, of course.